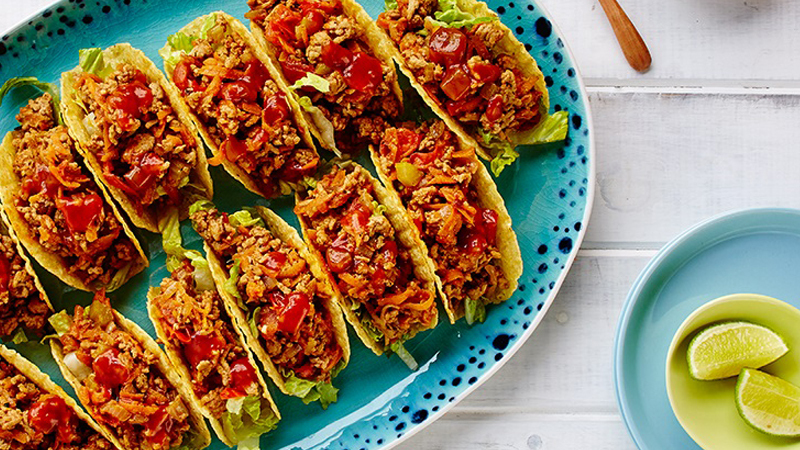 Quick, easy and super tasty Bolognese crunchy taco recipe. Perfect for the whole family. Heat oil in a large frying pan. Add onion, celery and carrot and cook over medium heat for 5 mins or until softened. Add pork mince and cook for 5 mins, stirring with a wooden spoon to break up any lumps. Add Taco Spice Mix and stir for 1 minute. Add ¾ cup water and tomatoes, simmer for 2 minutes or until sauce thickens. Build your own Mini tacos with pork mixture, lettuce, Parmesan cheese and Mild Taco Sauce.